Floodplains are considered a critical vital sign of Puget Sound recovery by the Puget Sound Partnership. Yet according to the agency, “there is currently no agreed-upon definition of a floodplain,” and much remains to be understood about the social and ecological implications of their protection and management. A June 6th workshop at the Center for Urban Waters in Tacoma explored the state of the science of floodplains in the region. Approximately 60 people attended the workshop, which was organized by the Puget Sound Partnership, the Puget Sound Institute and the Puget Sound Science Panel. Participants discussed floodplains from the perspectives of both the biophysical and social sciences. Of particular importance, according to panelists, is the need to determine scientific thresholds for identifying degraded or functional floodplains. 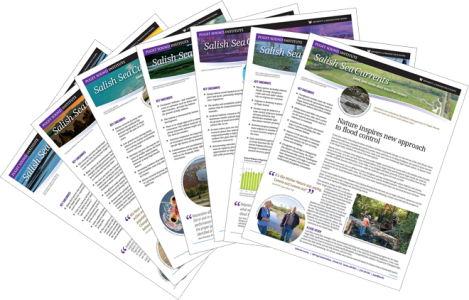 The Puget Sound Partnership hopes to use these thresholds to measure its goal to restore 15% of Puget Sound floodplains with no net loss by 2020. While questions remain about the definition of healthy floodplains, scientists recognize their importance to both humans and the ecosystem. The USGS estimates that valley bottom areas cover about 5% of the Puget Sound basin, but are the site of 30% of highly developed urban areas and 70% of cultivated land. Healthy floodplains are also a key ingredient for salmon health. Studies show that they promote faster salmonid growth, and increased productivity, among other benefits.